Seeking Adventure And Gold? Crack This Poem And Head Outdoors An eccentric millionaire from Santa Fe hid a chest full of gold and precious gems in the Rocky Mountains six years ago. Today, thousands of treasure hunters are obsessed with finding it. Forrest Fenn is a millionaire who hid a treasure chest in the Rocky Mountains. Adventure seekers look for clues based on a poem he published in his book, The Thrill of the Chase, with hopes of claiming the million-dollar treasure. Somewhere in the Rocky Mountains, there is a bronze chest filled with gold and precious gems. The search for this hidden treasure has become a hobby for some, an obsession for others, and for one recent searcher — a fatal pursuit. 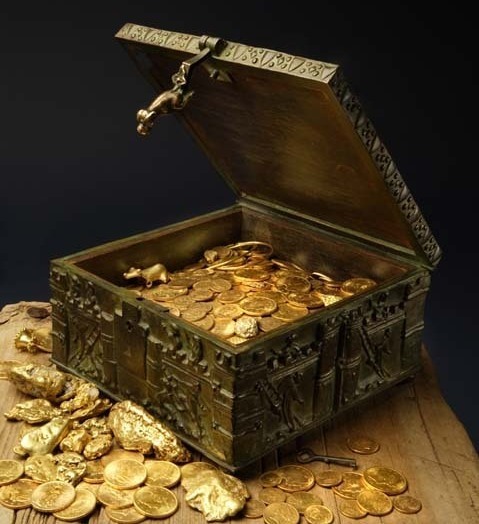 Forrest Fenn's treasure is in an ornate, Romanesque box that might be filled with gold nuggets, gold coins and other gems. The man behind the treasure is Forrest Fenn, an 85-year-old millionaire, former Vietnam fighter pilot, self-taught archaeologist, and successful art dealer in Santa Fe, N.M.
"No one knows where that treasure chest is but me," Fenn says. "If I die tomorrow, the knowledge of that location goes in the coffin with me." The ornate, Romanesque box is 10-by-10 inches and weighs about 40 pounds when loaded. Fenn has only revealed that it is hidden in the Rocky Mountains, somewhere between Santa Fe and the Canadian border at an elevation above 5,000 feet. It's not in a mine, a graveyard or near a structure. For further clues, you have to read the poem in his self-published book, The Thrill of the Chase. "'Where warm waters halt,' no one agrees on what that means. Does that mean where two rivers converge? Does that mean where a hot spring pours into a river? Does that mean at the Continental Divide?" says Sacha Johnston, an avid searcher in Albuquerque. She runs a website that sells Fenn treasure tchotchkes. 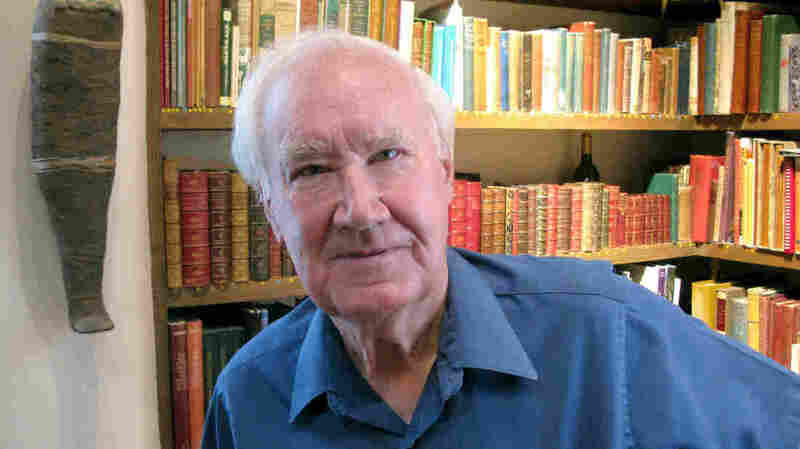 Now, six years after publication of the poem, tens of thousands of people have reportedly gone looking for Fenn's treasure, thought to be worth well over a million dollars. Fenn sits at his laptop in the study of his Santa Fe manse, his blue eyes twinkling mischievously. He reads emails all day from treasure hunters imploring him for further clues. "That's the kind of email that I don't respond to," he says. "Because if you want me to give you a clue I'm not going to answer your email." The treasure map and poem from Fenn's book. Surrounding him is his extraordinary collection of Native American artifacts such as Apache dolls, moccasin boots and buffalo skulls. "I love antiques, particularly American Indian," he says. In the 1990s, he was criticized by Southwestern archaeologists over his excavation of a Pueblo Indian site that he owned. They consider him a plunderer; Fenn thinks they're "clubby fussbudgets." The war over Indian relics has largely subsided. Today, Fenn is all about the treasure. He says he hid the box in the midst of the Great Recession to cheer folks up and to get them off their couches and into the great outdoors. "Sure, I'm eccentric," he says. "I pride myself on being eccentric. I don't want to go down the center line like a lot of people do." The Missing Treasure Hunter ... And The Missing Treasure? The hunt for the treasure can become an obsession. Randy Bilyeu was a 54-year-old retired mechanic who had moved from Florida to Colorado to look for the bronze box full time. He was last seen alive on Jan. 5. His car, a raft, and his little dog were found near the Rio Grande south of Santa Fe. Fenn is delighted the quest has motivated so many people to discover the Rocky Mountains, but he cautions: "We don't want to get anybody else lost. Be prepared. Take a GPS. Take at least one other person with you. And wait [until] the snow and the ice melts." Is the treasure really worth risking your life over? Doug Preston is a best-selling author and a longtime friend of Fenn's. He says he saw the chest in the walk-in vault in Fenn's house before he hid it, and Preston can attest that it was filled with gold nuggets, gold coins, pre-Columbian gold figures, rubies, sapphires, emeralds and diamonds. "As far as proof goes [that he hid the treasure] there's no proof," Preston says. He also lives in Santa Fe. "It's hard to prove a negative. The negative is that the chest is gone. It's not in his house and it's not in his vault. And also knowing Forrest for as long as I have, I can absolutely say with 100 percent confidence that he would never pull off a hoax. I'm absolutely sure that he hid that treasure chest." A noted New Mexico archaeologist contacted for this story says he, too, saw the treasure and he also believes Fenn is not a trickster. 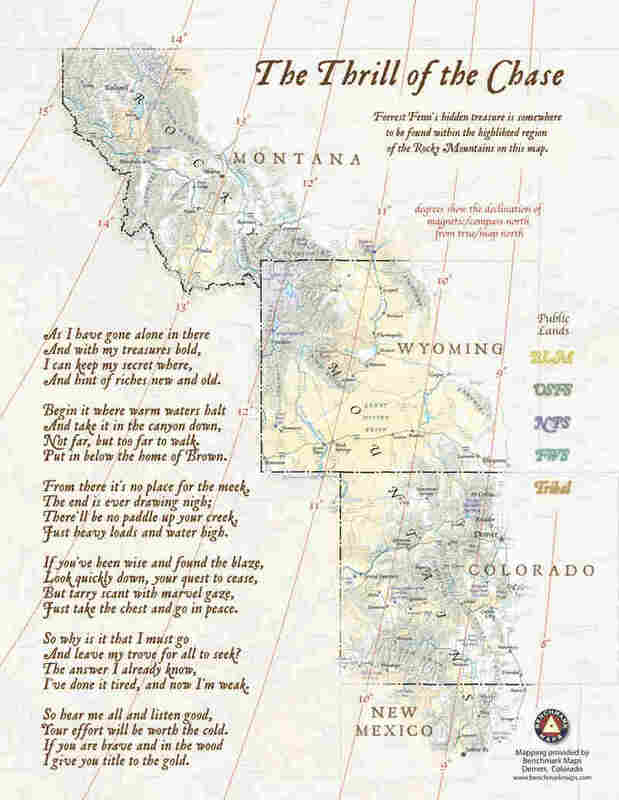 The searchers read and re-read the cryptic poem and pore over topographic maps, waiting for the "aha" moment. Then they trek through aspen forests, explore riverbanks, and rappel down cliff sides looking for the treasure. "You go out, you look, you don't find it, you come back home, you go through your clues again, your solves again and you think, 'Where did I go wrong?'" says Cynthia Meachum, a retired high-tech worker in Albuquerque who says she's been out at least 60 times looking for the treasure. "And you go out and you do it again. And I have actually seen some of the most spectacular scenery because of this that I ever would've seen." And for that, Fenn would be pleased.